Anthony Clarke: The story goes that when my parents brought me home as a newborn the only way they could get me to settle down and stop crying was to play a recording of David Oistrakh performing a Beethoven violin concerto. Evidently within the first few bars I’d settle and…zzzz…fall asleep. I still have that same LP and I still have Oistrakh’s sound in my mind – that sound is what I aim for when I play. Of course being a newborn I doubt I remembered the actual experience but the residual affect of listening to Oistrakh somehow became ingrained and played a significant part in my musical personality. It’s now well known that expecting mothers should listen to composers like Mozart because it’s good for the baby’s development and of course all children should study a musical instrument. AC: Despite the overwhelming influence of the Oistrakh recording, as a primary school aged child I think I had a negative reaction to hi-fi initially. My parents owned quite a few LPs but I was reluctant to listen to them because the system they had was terrible. As an infant, I didn’t have a choice, the sound was there. It wasn’t until my first job (probably I was 20) when my boss, David Craddock, was very much into Bang and Olufsen. We became firm friends and still are, he was my mentor and through him I started to realise that the sound of a hi-fi could begin to emulate the sound of real instruments and voices. Perhaps I’ve become a bit of a musical snob, but by being so close to the sound of acoustic instruments on a daily basis it makes me realise that unfortunately no hi-fi system could ever achieve an absolute live sound quality. Every system I heard sounded inferior, and I used to think that I didn’t want to deal with hi-fi. But my thoughts, acceptance of limitations and systems have evolved over the years and now I’m hooked. AC: That is likely because many musicians can only afford very average hi-fi systems! And recording in good studios also comes back to what one can afford and time constraints. My wife, Bili, and I have been very fortunate, but still there are some components I lust after that we either can’t afford new or can’t justify the new price tag. Some of the asking prices for hi-fi components are ridiculous. But having said that, we have spent hundreds of thousands of dollars on stuff like this [he says touching his 1763 Calcanius viola], but that is our life blood. AC: I’m not sure it ever will arrive. My listening room is plagued with a few issues that I cannot easily fix. Unfortunately the room is just too small but I do have plans for later on once we move. As it is, I think I would be foolish to upgrade extensively but what I can address now are my power cables. I always feel that a great hi-fi system must have valves in it somewhere. I’d like to try a high-end preamp with valves in the front-end, something like an Audio Research. I think that would be really lovely, especially with the Utopia Maestro speakers. I like simple systems, systems without excessive cabling running everywhere. Something like source, preamp, power amps and speakers is all I want. 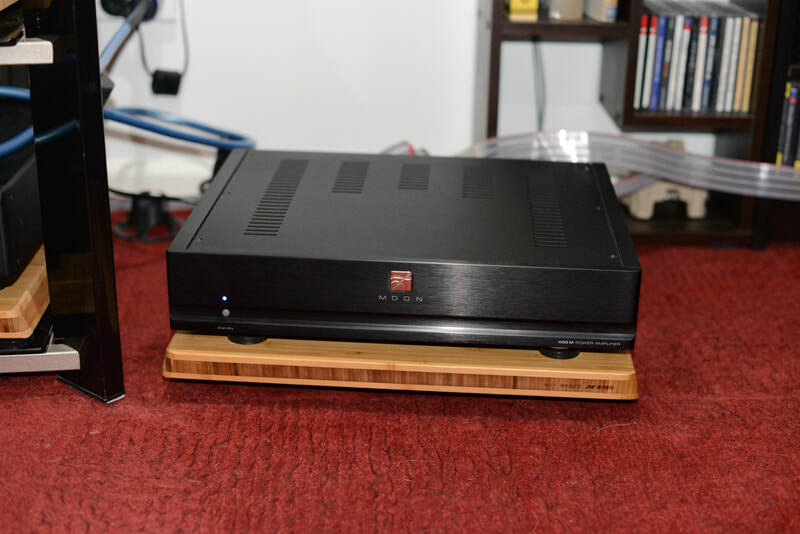 Integrated amps are becoming very good, but I still think I’d rather have monoblocks. Recently there was a pair of IRS 5’s on sale in StereoNET. I considered buying them but thought that the shipping cost to Sydney would be astronomical, and they might be too heavy and fall through my wooden floor, so I gave them a miss. But that did get me thinking about upgrading my Orpheus speakers. I was thinking of buying the Focal Utopia Scala but then these [pointing to his recently purchased Focal Utopia Maestro’s] became available and I love them. 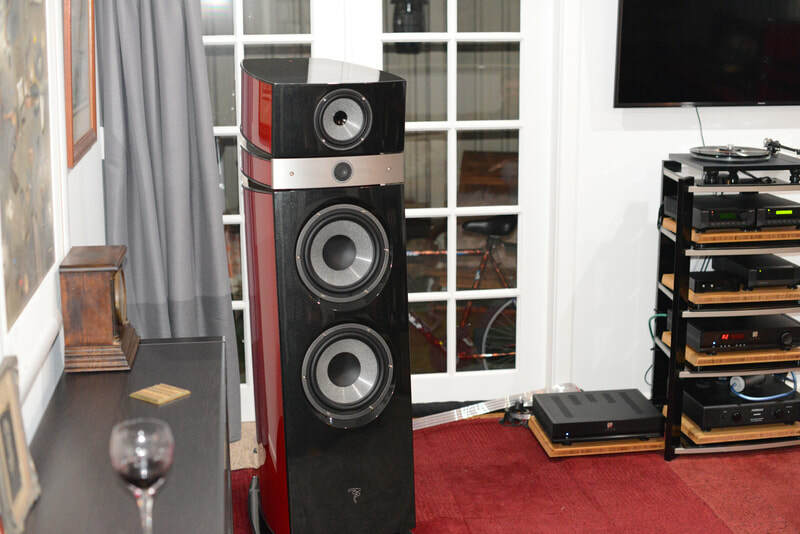 AC: Well, I wouldn’t sell my Focal Utopia Maestro speakers but everything else is upgradable. 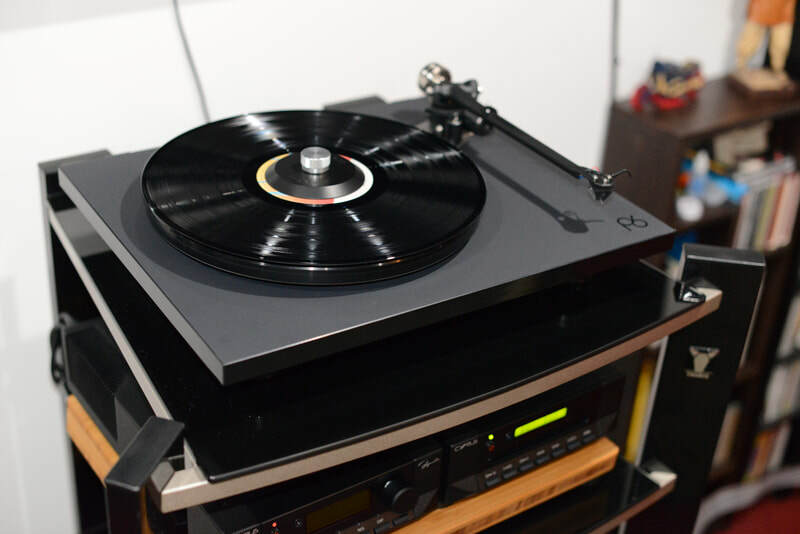 AC: I had my eye on a VPI Prime Signature turntable but I couldn’t justify the asking price. It’s probably fortunate that I didn’t buy it because I would not have had all the funds available to buy the Maestros. I regularly listen to and occasionally correspond with Paul McGown of PS Audio. He has a daily blog in which he demonstrates a good, common sense approach to audio. Paul clarified that there is a big difference between high-end audio and high budget audio. He recommends you buy the best speakers you can afford and then mould your system around that which I think is good advice. BTW - back when I had the B&O speakers and Sony integrated amp, I found I could just relax into the music, but now I hear recordings warts and all … it’s distracting! 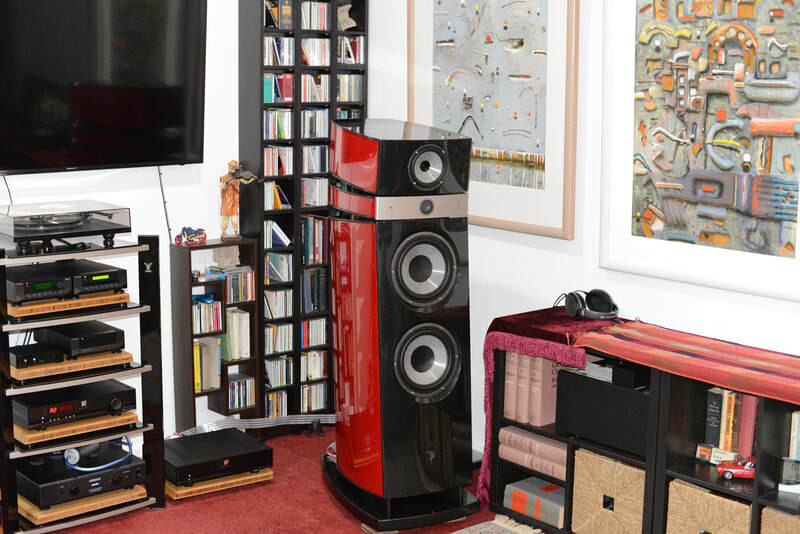 The Utopia speakers are just so resolving which tempts me to upgrade the rest of the system! But for now, I’ll try to hold off and only upgrade my power cables. Eventually I’ll get a better preamp with valves and so on. AC: In Bili’s [Anthony’s wife] home city of Ganzhou China there are two hi-fi markets. One contains new hi-fi, the other is second-hand hi-fi. These are huge complexes with hundreds of shops in them. Now, you don’t typically go to the market for new hi-fi, because that new Audio Research product is quite possibly not a genuine Audio Research at all, but some cleverly marketed knock-off. But the second-hand market is really interesting to walk through and get some ideas. In this market, we heard a solo cello. It was fantastic playing, we thought that it must be someone practicing or busking. We really wanted to find this person so we followed the sound. Eventually we found this grotty little second-hand hi-fi shop, and there it was. Two old American theatre horn speakers incorrectly setup connected to hand-built valve amplifiers and an old turntable – we looked at each other and just couldn’t believe the sound, it was phenomenal. Nothing else I’ve heard has come close to that sound, but then again a distant memory can play tricks. I’ve also heard memorable organ music from big Klipschorn speakers, the La Scala’s likely. But they looked like I made them! [both laugh] – I think the aesthetic appearance of a system is important to me. AC: I don’t think I’ve sold anything. I’ve just moved it to somewhere else in the house for another use or gave unused components to friends. I did audition an EAT C-Sharp turntable for a while but there were certain aspects about the sound I didn’t like so I returned it and bought the Rega P6. I also auditioned an Audio Research LP-1 phono preamp. 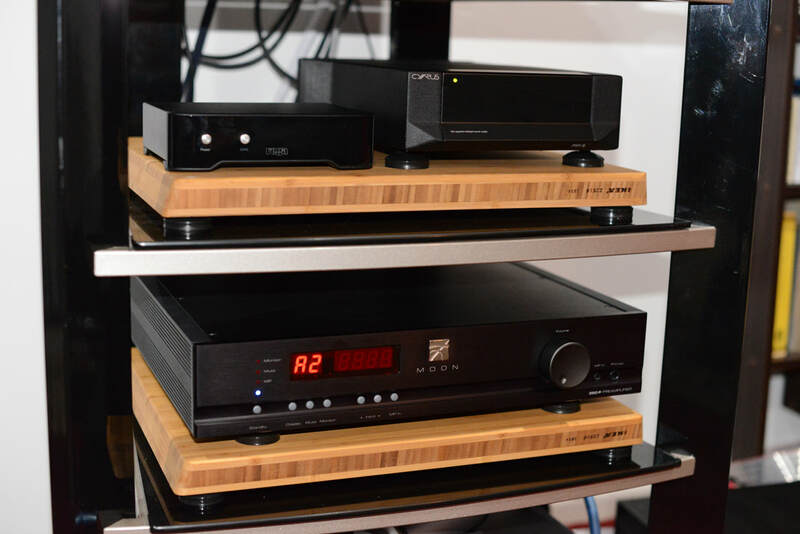 I loved the warm sound but preferred the sound of the Cyrus Signature phono stage. AC: I have two sets of recordings that I use for judging how good or otherwise a component or system is and both of these sets I use for listening as well. One set is from the BIS label – these are very good recordings. I use them for judging clarity, depth of sound, dynamic range, etc. The other set consists of poorly recorded albums but the interpretations are great – I want to hear what they sound like. If they are appalling then most likely I can’t tolerate listening to them. Unfortunately with my new speakers I have found there are some recordings that I used to love that I just can’t listen to anymore. So instead of archiving these recordings I listen to them through my Sennheiser 650 headphones. AC: 99.9% classical! But I also listen to some Queen, the Beatles and Ella Fitzgerald but predominantly it’s all sorts of classical: string quartets, symphonies, operas, oratorios…everything. TW: You say in your bio that you collaborated with Barbra Streisand and Michael Crawford. Tell us a bit about that. AC: I played in the orchestras for Barbra Streisand and Michael Crawford for their Australian tours. It was a great experience to be part of the tours and watch how each one prepared for a public performance. They prepared for a performance in much the same way we would approach it. Strictly professional with everything worked out to the nth degree. The main difference is that they get paid a lot more than we do. It was great fun and I learned a lot. AC: The complete works of Bach, although that is a lot more than three. NASA encapsulated Glenn Gould’s recording of Bach’s Goldberg Variations in a probe that is sailing off to distant worlds. They first discussed what they should send and one guy suggested the complete works of Bach but then another guy said that that would be bragging about what humans were capable of. [TW - But to an alien, they might think its rubbish! Both laugh heartily.] It’s very rare that I listen to a work by Bach and don’t feel moved, he touches my soul. To appreciate a composer, you need to consider who influenced them and how much they influenced later generations. Bach’s influence on Western music is beyond comparison – much of today’s music stems from what and how he composed. When you consider he came from and lived most of his life in smallish towns, it makes you appreciate how phenomenal his achievements were. TW: You completed your doctorate with research into score modification of Beethoven’s 9th Symphony. Isn’t it expected that we abide by the original intent of the composer? AC: Intent yes but some people consider the written text as gospel. There’s a fundamental problem with musical notation, it’s just a language and as with any language it’s limited in what can be expressed. Some people use language well, others don't, some understand it well, others don't, take Americans as an example. [Laughs]. From about the 1960’s we have lived in an age of extensive music research where many justifiable questions were raised with regard to modern interpretations. This research movement has been known by such names as the period performance practice, historic performance practice and now as being historically aware. However, whilst the written text is important it can’t give the whole story. This is where the concept of Werktreue becomes important. The composer's written indications should not be taken as gospel but rather as an indication of the composer's intentions. As performing musician’s we constantly struggle with the question – what are the composer’s intentions? A large part of my doctorate research focused on this point. I choose Beethoven’s 9th because the vast majority of performances dating from its premiere, of which Beethoven was involved, to the present day have been modified from the original text. I believe that the main problem with many modern interpretations concerns the fact that up until the early part of the C20th the vast majority of performers and conductors were also composers. As such, coupled with their extensive musical education and also by performance traditions, they understood another composer's intentions. Nowadays we purport to know more but are actually far less wise. One of my favourite conductors is Carlos Kleiber. His interpretations take Werktreue into consideration and bring the music to life without destroying the composer's intentions or musical integrity. A perfect example of this is his live recording of Brahms Symphony No.2 with the Vienna Philharmonic. I have NEVER heard Brahms sound so wonderful. It’s a mesmerising performance where Kleiber manipulates almost every phrase in order to bring out the true musical intent. If we take the printed text argument to the nth degree, then some would argue that all modern interpretations of classical piano music are actually transcriptions in that all of this music was written for the forte-piano and not the modern piano. And none of the music of Bach should ever be performed on the piano. Reputably Bach played an early prototype forte-piano and commented that the fragile instrument showed potential but he never composed for the instrument. TW: But given that many of these compositions were written 150-200 years ago, how would we know for certain how that artist intended it to be played? AC: True, we don’t. But the other side of the coin is how dare you interfere with a composition? How dare you change what Mozart or Beethoven or Bach wrote – what gives you the right to change that? Probably one of the best examples I can give you is that there was a friend of mine on the staff at the Sydney Conservatorium of Music, and I asked him if he would proof read my dissertation. By way of background, he’s a composer. We had lunch before he read my dissertation and I asked, “Would you allow me to conduct your work and modify certain passages?” “Under no circumstances! What I’ve written on the page is what I want you to do.” I said, Ok, read this [the dissertation]. We had lunch a week later, and he said “You can do whatever you want”. It gets back to what I said earlier – what is important is that one honours the composer’s intentions and maintains musical integrity – what they wrote on the page is just the skeleton, as artists and performers we help bring the music to life. Let me give you another example. Say a composer has written a chord for full orchestra and writes “forte” – if everyone in the orchestra plays their part loud then the sound is unbalanced. What needs to be done is that the trumpets should play mezzo-forte, violas a little more and so on. That’s the way you balance the sound. So to an audience the orchestra will sound forte but not individual instruments. As we moved through the centuries the level of written detail contained within scores increased. The reason for that may be that although we are seemingly more highly educated and believe that we know more, in fact we actually know less. In Bach’s time it was taken for granted that performing musicians and even audiences would understand the implications of the printed text and the parameters within which it may be performed. Many of these musicians understood the intentions of particular composers because of their close associations, but today musicians are expected to be experts in every field, baroque, classical, romantic, 20th century, etc. By the way, it’s only been in the last 150 years or so that the idea of a piece of music as a museum piece has existed. Up until around the 1820’s, audiences only wanted to hear new music. AC: Not good enough! [Laughs] Let’s take it from the speakers – I love them, I think dynamically they are very good. I like the clarity of the midrange and upper end, and the bass is nice and tight. I would like a bigger soundstage with more depth so this means I have to rethink the room and the front end equipment. Acoustic instruments sound like a very good recorded performance – not like the real thing. I think distortion and noise has something to do with it. Live acoustic instruments distort but high end hi-fi manufacturers don’t like distortion. So maybe there is some distortion we hear but we don’t recognize it and therefore don’t measure or can’t measure it. It begs the question, are we measuring the right things? And do we presently have the equipment to make such measurements? They’ve pulled Stradivari violins to pieces and put them on different types of measuring devices to see exactly how they vibrate and produce sound, and then made violins with identical measurements, but they didn’t sound the same... at all. Actually some sounded appalling. TW: In what way does music affect your life, your emotions and the way you feel? I think you’ve answered this question many times over already! AC: [Laughs.] In my mind I’m always practicing, always doing something, even now whilst I’m talking with you. The only time I stop is when I listen to music but even then I think, ummm, that passage needs to be balanced more this way or this instrument needs to come down in volume, that instrument needs to articulate more, and so on. It’s rare that I can totally relax and just listen and think yeah, that was good. Red wine certainly helps! But I really love listening to different interpretations. Since I’ve become more involved in high-end audio and joined the Sydney Audio Club the magic of music has been spoilt a little. We can easily fall into the trap of listening to the system rather than the music. The most important thing for me is the musical interpretation – not the system, but I do have to occasionally remind myself. AC: Years ago you could walk into a hi-fi shop and immediately see proper hi-fi equipment. When you walk into hi-fi shops now, the first thing you typically see are TV panels and sound bars. There is nothing wrong with that on the proviso that it’s not viewed or purported to be high end or that it is what the shops are primarily promoting. The guys in the Sydney Audio Club want the high-end sound, but don’t want to pay the high-end price tags, and I suspect that some people into high-end audio can’t afford it either. This scenario breaks my heart because as a musician I hear real instruments every day yet these guys can’t – they hear only a facsimile of the real sound. Regardless of how good a hi-fi system is, unfortunately it can never compare to a live performance. I think the biggest weakness with recordings is the microphones and I think the hardest music to record is symphonic. It doesn’t sound right if you mic every instrument and if you use, say only two mics, then you lose impact, spatial awareness and so on. But back to the question… what I would like to see is the situation where more people can get into high-end audio. I am shocked at the prices of some high-end gear. I think that more and more high-end companies will start to make great equipment at price points more people can afford – I think they’ll have to do this to survive. This is already happening, and I hope that this trend will continue. AC: This is really a continuation of what I was saying before. The audio industry needs to get more sensible... $1000 per speaker for isolating feet? Really? And this Shun Mook device here is so effective that it’s sitting in its original box on the shelf [both laugh]. There is a moral issue here that I find hard to blindly accept. In the science and medical worlds you have to quantify and qualify everything, you cannot just make blanket statements. In the hi-fi world things are so subjective, you can claim whatever you like without providing any evidence. In a sense, its snake oil, but in another sense, it may work for some people with their particular system – it’s such a personal thing. My viola has beautiful tonality to me, but give it to another musician and they may say it’s not the sound they’re after. I would like to see the industry evolve to produce more affordable equipment such that more people can get into high-end audio. 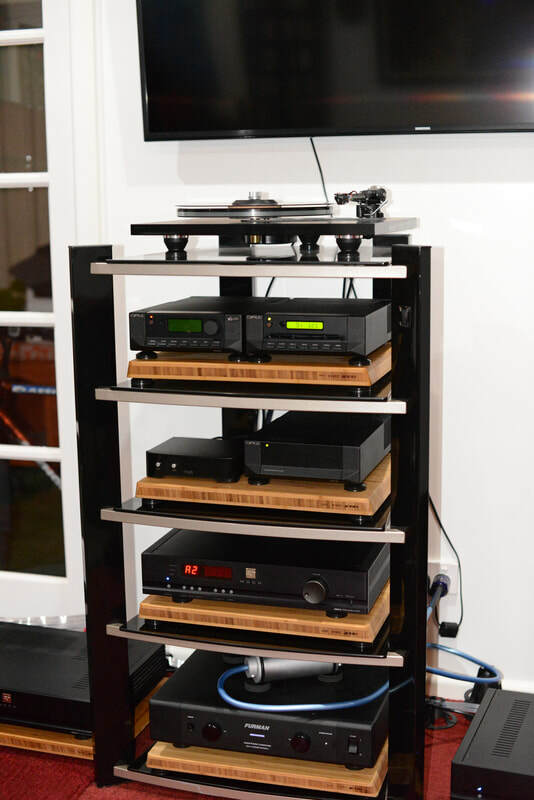 I think the only way the high-end audio industry is going to survive is if it allows more people to be involved and offers younger generations the opportunity to experience how wonderful high end audio can be.